Eumetsat and the European Space Agency (ESA) have been informed by the launch service provider, Starsem, that the launch of the MetOp-B satellite by a Soyuz rocket, scheduled for 23 May from Baikonur, had to be postponed. This is due to additional measures required to ensure the availability of safe drop zones for parts of the launcher after lift-off. The launch has been postponed for some weeks, until appropriate measures are implemented. 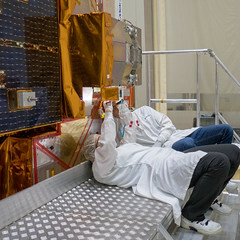 It is expected to take place in the second half of July, after the launch of the geostationary MSG-3 spacecraft, which is scheduled for 19 June from CSG, Europe’s Spaceport in French Guiana.